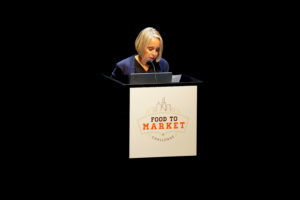 Linda Mallers of FarmLogix presented the pitch for Team Leverage at the Food to Market Challenge finals at Chicago’s Museum of Contemporary Art on Oct. 26. 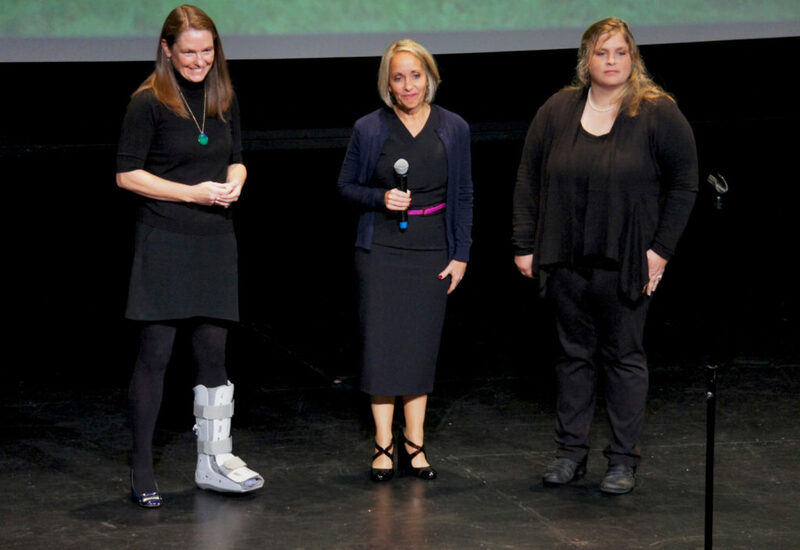 The winner was announced at a pitch event held Oct. 26 at Chicago’s Museum of Contemporary Art. The Food to Market Challenge, which sought the best solutions to local food supply chain issues affecting metropolitan Chicago, is a project of Food:Land:Opportunity, a collaboration between Kinship Foundation and The Chicago Community Trust that is funded through the Searle Funds at The Chicago Community Trust. • Jessica Smith of This Old Farm, a food hub in Colfax, Indiana, from which schools, institutions, retailers and restaurants source locally and sustainably produced meats, produce and other items. This Old Farm also facilitates better utilization of food resources and reduces waste through whole animal usage. Team Leverage coordinated its proposal with Leslie Fowler, who heads Nutrition Support Services for Chicago Public Schools. 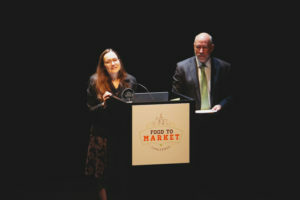 Renee Michaels of Kinship Foundation and Terry Mazany of The Chicago Community Trust — whose organizations partnered on the Food To Market Challenge — addressed the audience just before the winner of the $500,000 award was announced. The team persuaded a panel of five judges that its concept would make the $500,000 award go a long way. Through its institutional partners such as CPS and through direct sales to families, Top Box projects potential growth from 8,000 current customers to 250,000 households. Team Leverage envisions creating 700 or more new dropoff sites for convenient pickup in communities in and around Chicago. Top Box packages three different varieties of boxes: one that is produce only, another that contains both produce and frozen protein sources; and another that contains microwavable meals. Each box contains enough food for 14 meals, and this high-quality food is made available at the low cost of $1.29 per meal. “Sheila [Berner Kennedy] and I were introduced in the spring by a mutual friend, right after the Challenge was announced. We thought we’d be a good fit with each other for the Challenge, being that their constituency and the students we service at CPS might actually be the same families, and certainly live in the same neighborhoods. Leslie [Fowler] has engaged FarmLogix since 2013, so we talked to her about offering support to market the program, which would also leverage our distributor relationships. She and her team at the Office of Health and Wellness were very supportive. Leslie is fiercely driven by nutrition as necessary to educational success, so she was very supportive of getting healthy food into the students’ homes and helping any way she could. Jessica Smith and I work together on a program we do for Loyola University, so we also had the supply chain of product coming in regularly. And Jessica’s execution is flawless. For the most part, the more logistics options a program has, the more chance it has to scale. So our proposal engages logistical optionality. Delivering to a large number of schools takes a village of distributors, so we knew that piece was essential. It’s that last mile that makes the difference. And Top Box Foods already has their stellar inroads into the community with their own community partnerships and supply chain. 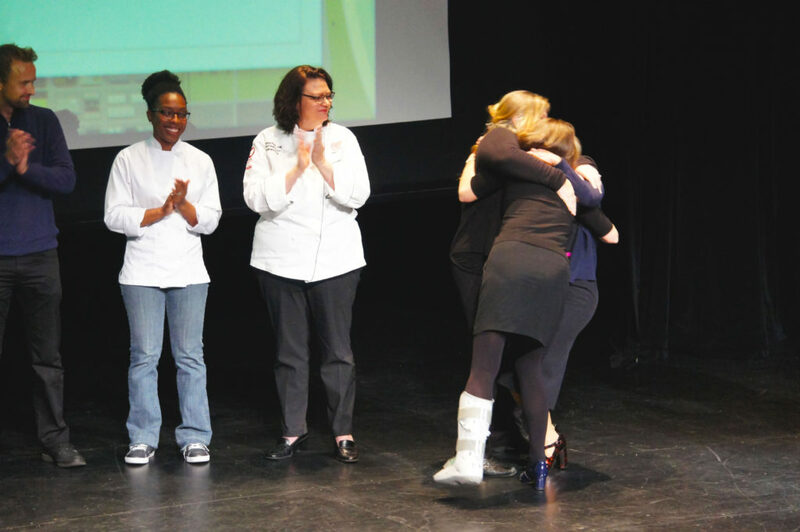 Sheila Berner Kennedy of Top Box Foods, Linda Mallers of FarmLogix, and Jessica Smith of This Old Farm — the lead members of Team Leverage — answered questions from the Food to Market Challenge judges during the pitch session (top), then embraced in celebration after they were named winners of the $500,000 award. “This collaboration is the best of all that CPS stands for. We seldom have an opportunity to marry the best of our operations with our love for our community. The ability to allow families to have access to foods that we introduce to children during the academic day, along with nutrition education and recipes, means that those families can develop healthier habits and lives. Our students don’t often have the opportunity to take what they do at school home. This allows for them to influence healthy eating habits at home! This program is intended to change food deserts into fantastic areas to have access to high-quality affordable foods. 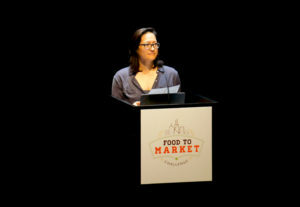 Monica Eng of WBEZ Chicago Public Radio, one of the city’s leading food journalists, emceed the Food to Market Challenge pitch and award event. Team Leverage was among the five finalists selected from an initial field of 24 applicants. 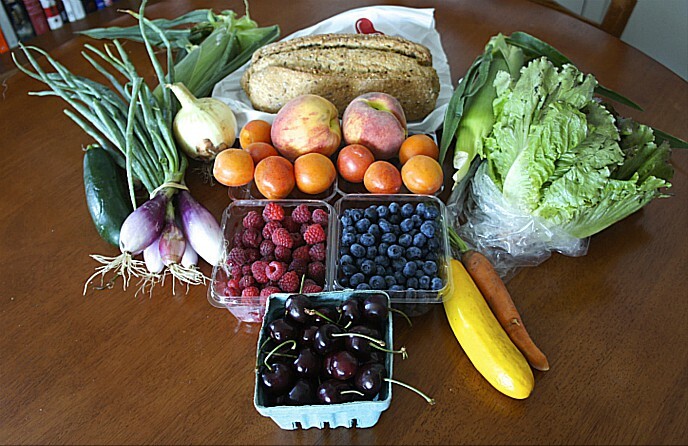 All have the common goal of increased supply of — and access to — locally and sustainably produced food in the Chicago metropolitan area, to help create a food system that is healthier, more environmentally sustainable and more economically dynamic. The following (in alphabetical order) are the descriptions of the finalists’ proposals provided by the Food to Market Challenge. Click here to learn more about them, the competition, and the other entries in the contest, including a team organized by FamilyFarmed that proposed to create a regional grain hub. The Food to Market challenge is among the major projects supported by Food:Land:Opportunity to create a resilient local food economy that protects and conserves land and other natural resources while promoting market innovation and building wealth and assets in the Chicago region’s communities. 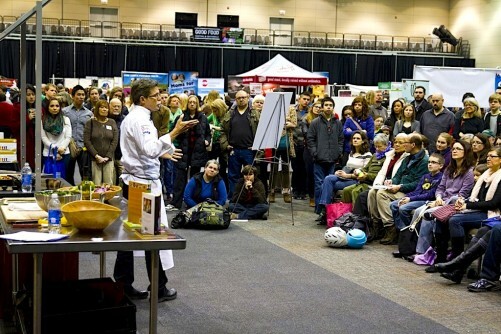 These include FamilyFarmed’s Good Food Business Accelerator. This entry was posted in Awards, Child nutrition and health, Family Farms, Farm to school movement, Food access, Food and community, Food and health, Food Hubs, Food to Market Challenge, Healthy eating, Healthy eating for children, Local Food, Logistics, Regional food systems, School food, Supply chain and tagged Chicago Public Schools, Chris Kennedy, FamilyFarmed, FarmLogix, Food to Market Challenge, Food:Land:Opportunity, Kinship Foundation, Searle Funds at The Chicago Community Trust, Sheila Berner Kennedy, Team Leverage, The Chicago Community Trust, This Old Farm, Top Box Foods. Bookmark the permalink.